The Mutant Liberation Front attacks X-Force. At a free clinic, a couple learns from Dr. Tucker that a prenatal test he's developed shows a 55% chance their child will be born a mutant. 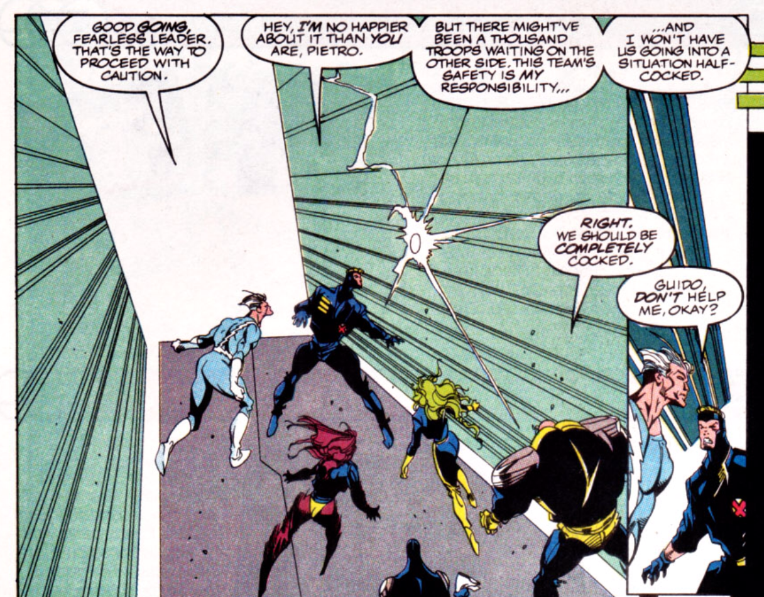 Meanwhile, the Mutant Liberation Front attacks X-Factor's headquarters, where they're holding Nasty Boys Hairbag & Slab. X-Factor forces them to retreat, but only after they've freed the prisoners. 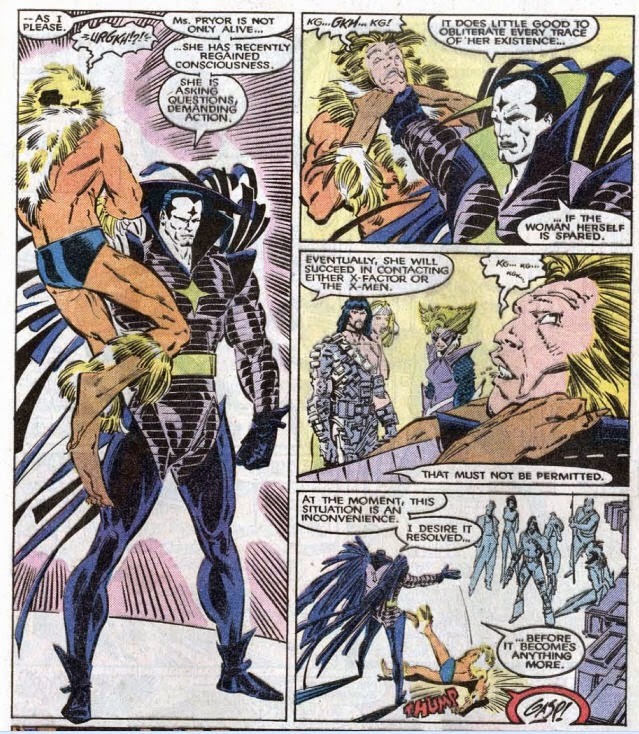 However, as Zero opens a teleportation portal, Polaris is able to grab hold of Stryfe and pull him partially through, trapping him halfway on either side of the portal. 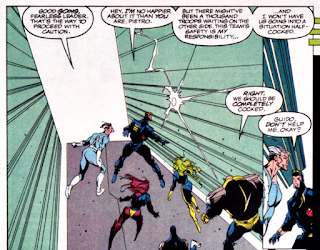 As both teams attempt to pull Stryfe onto their side, he uses a hidden weapon to force X-Factor to let him go, and they're left with nothing but his gauntlet. 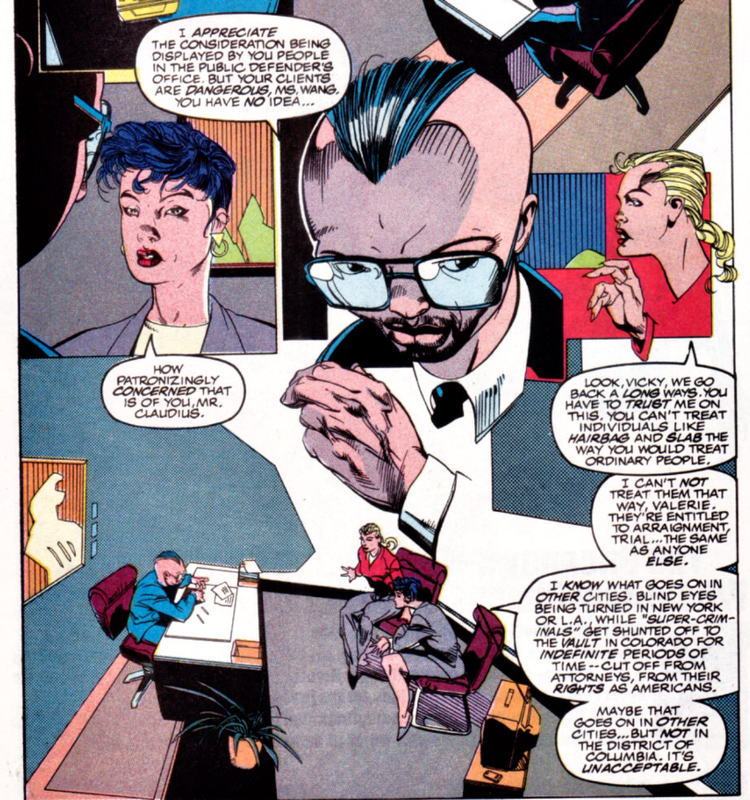 Later, Val and Alex debrief Jamie about his experience with the Nasty Boys, and realize that Mr. Sinister was their leader. Outside, Lorna is trying to get Rahne to open up when Cannonball suddenly flies down and scoops up Rahne. He says he's there to rescue her, but she insists her life is with X-Factor and Alex now. When Lorna and then Alex catch up to them, intending to arrest Cannonball, Rahne pleads with Lorna to let him go, and she does. At MLF headquarters, Stryfe gives the team a new mission: destroy Dr. Tucker, his clinic, and his mutant test. Cannonball guest stars in this issue, having seen Rahne during X-Factor's press conference and believing she's not herself. She basically tells him to bug off (though he's not entirely wrong, as we'll find out her attraction to Alex isn't of her own mind), but helps him escape when Havok tries to arrest him. 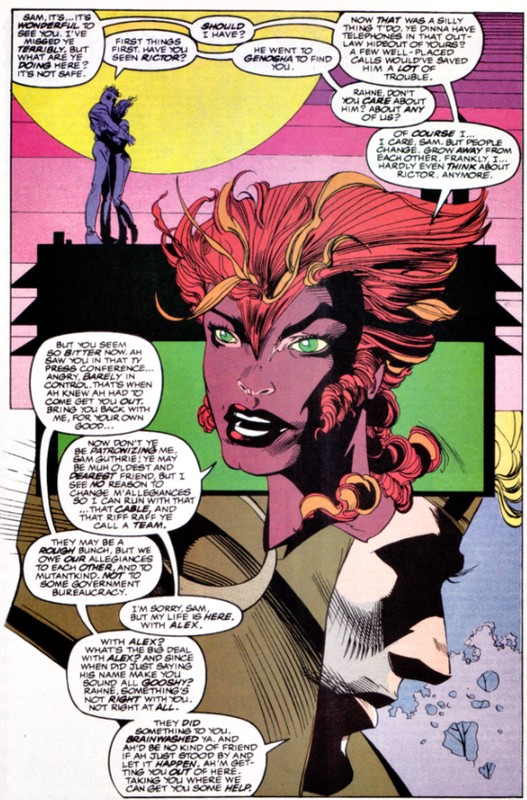 He also asks if she's seen Rictor, who left to find her in New Mutants #98; he'll pop up again shortly in X-Force. 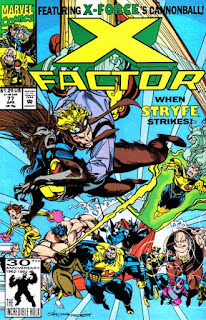 The Mutant Liberation Front, including Stryfe, pop up in this issue, making this their first appearance outside of New Mutants/X-Force, thus making little me believe the MLF was a bigger deal than the short-lived, one-team adversaries they really are. They are motivated to rescue the captive Nasty Boys because Slab is MLFer Thumbelina's brother, a relationship which is established here. 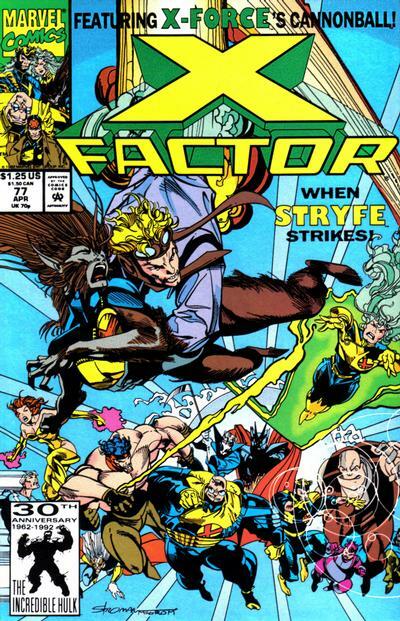 X-Factor manages to get ahold of one of Stryfe's gauntlets, and Wolfsbane finds the scent familiar but can't place it, as Peter David gets in on the "make vague hints about the connection between Cable and Stryfe game" (and is also a nice use of Rahne's history, as she'd know Cable's scent from working with him on the New Mutants). Discussing the Ricochet/Nasty Boys situation with Madrox, Havok and Val realize that Mr. Sinister was behind the whole thing, something Havok says Lorna is going to flip out about (a reference to the whole "possessed by Malice" thing). Madrox also describes Mr. Sinister as looking like Colossus with a diamond on his forehead. 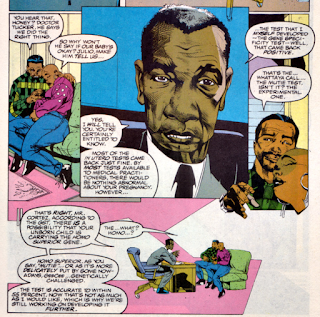 This issue introduces a pre-natal test that is able to determine, with some measure of accuracy, whether a child will be born a mutant, and it will serve as the centerpiece of next issue's plot, an attempt by Peter David to do an abortion story (which ultimately gets scuttled by Marvel higher-ups; more on that next issue). Vic Chalker has completed his battle suit as of this issue, making it large enough to fit inside, and powerful enough to operate. He then proceeds to step outside of his lab, where it starts to rain, and the rain proceeds to electrocute him to death. Thus ends the Vic Chalker subplot, for now, with another Chalker to shortly take up the reins before all this pays off in a future annual. Cannonball appears here between issues #5 and #6 of X-Force, prior to his death and resurrection, whereas the Mutant Liberation Front appears here and in the next issue after the backup stories and main story in X-Force #7 and #9-10. With X-Factor holding Hairbag and Slab of the Nasty Boys, Val Cooper gets into an argument with a public defender over the rights of super-villains, who says that all to often they get shunted off to places like the Vault in violation of their rights, an interesting idea that really deserves more exploration. 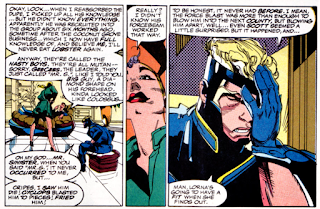 Havok continues to show disdain for the codename "Strong Guy", refusing to use it while giving orders. Rahne says she's having a hard time dealing with the events of the previous issue. Upon encountering X-Factor, Reaper (somewhat dumbly) believes them to be X-Force with a completely new lineup, something Strong Guy says is going to keep happening until they get their own trading cards. Madrox is mollified over his treatment during the Imposter Madrox situation by the promise from Val of a signed Linda Hamilton (hot off Terminator 2 at the time) picture. The MLF complain that X-Factor talk and joke more than X-Force. Havok says he doesn't want the team running off half-cocked, to which Strong Guy responds they should go off completely cocked. 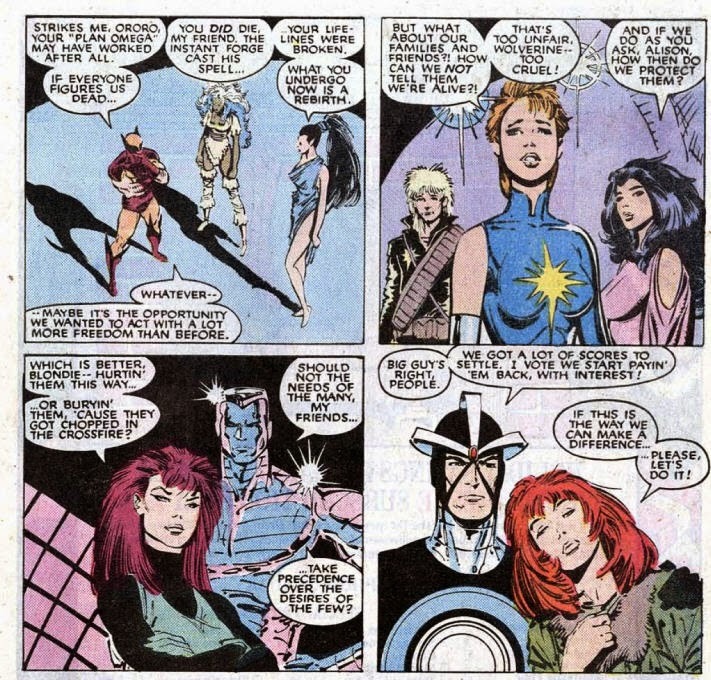 A letter writer asks why Quicksilver doesn't wear an official X-Factor uniform, the first of many times that question will be asked. A transitional issue, this wraps up the previous Ricochet/Mr. 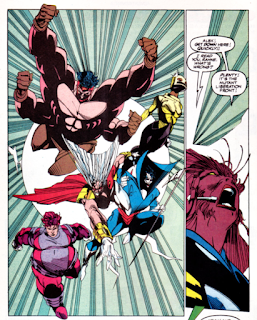 Sinister plotline while using the presence of the captive Nasty Boys to introduce the Mutant Liberation Front to this series and setup the next story. In doing so, it also speaks to the history, not just of this series, but of the X-books as a whole. 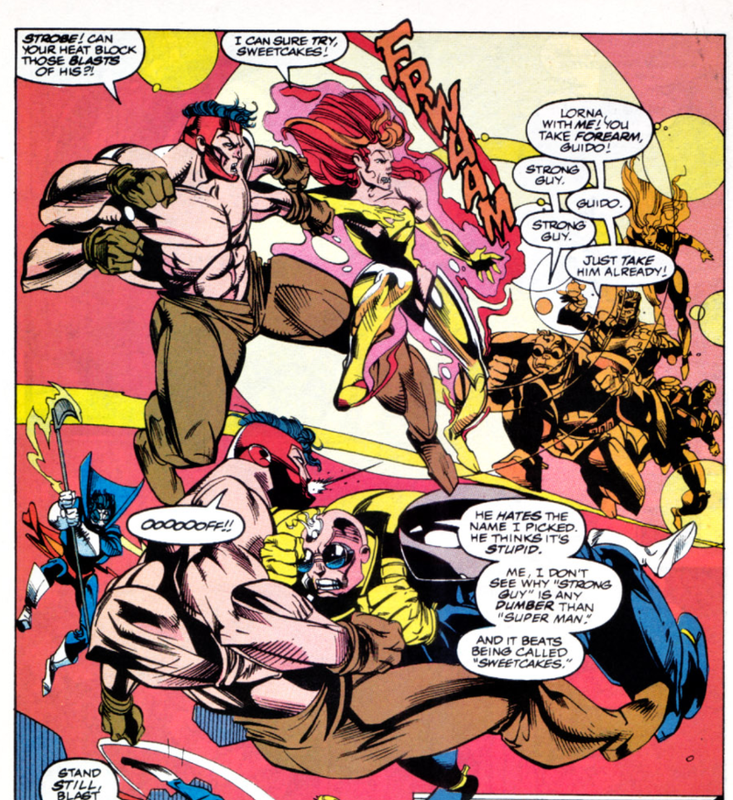 The MLF is ported over from X-Force, helping make them feel more relevant to the larger narrative, and also recalling Wolfsbane;s presence in the proto-X-Force iteration of the New Mutants (she's tackled the MLF below). 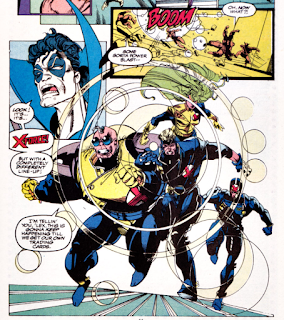 Ditto the guest appearance from Cannonball, which references the long history between him and Wolfsbane, name drops Rictor and the events of "X-Tinction Agenda", thus makinf the X-universe feel smaller and more knit together. Reading this as a back issue (next issue would be the first issue of the series I bought off the stands), I didn't always get the references (it would be a few years before I read "Inferno" and all the Polaris/Malice stuff to get exactly why Lorna was going to flip out when she learned that Mr. Sinister was involved with the Fake Madrox), but they helped sell the idea of these books as chapters in an interconnected narrative that stretched back years prior to what I was reading, that these characters had deep connections, not just with their teammates, but with characters in totally different series, which hooked me immediately, and immediately shaped my preferences in comic book stories. Even now, that sense of history and interconnection is powerful and pervasive, and while X-Factor has, since its relaunch, stood somewhat apart from the rest of the line simply on the relative strength of its writing, this issue helps the series fit into that larger tapestry. Next week: X-Men #7, Excalibur #49 and Wolverine #53. 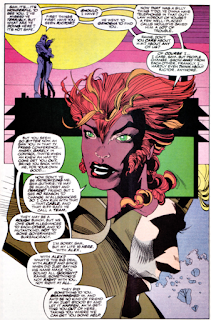 Val: Lorna, don't you think we should check to see if Rahne's feelings for Alex are the result of the Genoshan process? Lorna: Oh come now, it's not like anything bad happened the last time one of our friends started acting out of character and sluttier and made a play for Alex. Lorna: A few babies almost get sacrificed and you act like its a big deal. Val: Hello, operator, can you PLEASE get me the number of Doctor Samson? This is the first issue of X-Factor I bought off the shelves and the only one 9 year-old-me bought until X-Cutioner's Song. I always felt lucky I grabbed this one because I got Guido's joke about Stryfe wanting his glove back during the crossover. Also, since I didn't read X-Force at the time my first exposure to Stryfe was him getting pulled around in a game of tug of war. "Madrox also describes Mr. Sinister as looking like Colossus with a diamond on his forehead." I realize David is making a joke, but I just don't get this. Alex Ross and Jim Kreuger threw out some weird reference in EARTH X about it too, where it turned out Sinister was Colossus from the future or something (and Nightcrawler was actually Belasco). Except for their hair, Colossus and Sinister look nothing alike! Colossus is big and beefy, Sinister is sharp and angular. Colossus has metal skin, Sinister has normal (but chalk-white) skin. Sinister has jagged teeth and a little goatee on his chin. There's a lot more than a diamond on his forehead to make them look like completely, utterly different characters! So, in summary, it's a pretty lame joke because there's no truth in the observation. I dunno, I definitely see it - they both look like their body is made of horizontal strips of metal. Yes, there's more differentiating Mr. Sinister than just the diamond - his cape, boots, glove, the white face etc. But take those off, and he looks a lot like Colossus. Here's Colossus a couple issues later - slab on a diamond and whiten his face in that third panel, and he'd look very Sinister. I absolutely never saw the supposed Sinister/Colossus resemblance. Colossus' steel skin is his skin while Mr. Sinister clearly has a costume on and isn't steel. Coming to read the Mr. Sinister premiere issue by Silvestri I had lately been previously seeing Colossus drawn by Davis, Leonardi and Romita, and he hadn't really been going around shirtless at all. Of course there was also the two-year publicational hiatus mid-#224 so lots of time would pass for me before I would get to see a Silvestri-drawn Colossus and wouldn't have Mr. Sinister freshly in mind. Hmm... Well, sure, when you put it that way! It never really occurred to me that when people said Colossus and Sinister looked alike, it was based also on their bodies. I guess because (as Teemu notes) Colossus's skin actually looks like that while Sinister is wearing a costume. But the horizontal lines, boots, and even the pointy shoulder things do help to sell the similarity. Still not totally on board with it, though! When I briefly returned to the X-books for Inferno and saw Mr. Sinister, well… what Austin said. I don’t know that I assumed there must be a connection between the characters, but I found the resemblance odd. There are only so many ways to draw a character with a dark, metallic, widow-peaked flattop and no pupils and pale skin, I realize; when one of your established characters already fits the bill, however, and your series has a growing rep for everything being connected, it’s unfortunate if you were too close to the actual production to realize that readers would take the results to be either a clue you didn’t intend to place or a coincidence likewise worthy of comment. That being said, I can’t argue that David putting a lampshade on it helps. And while I didn’t recall Earth X retconning in (or whatever; it’s possible-future/alternate-reality stuff) a link, I agree that’s weird to do after Sinister’s actual backstory was established. 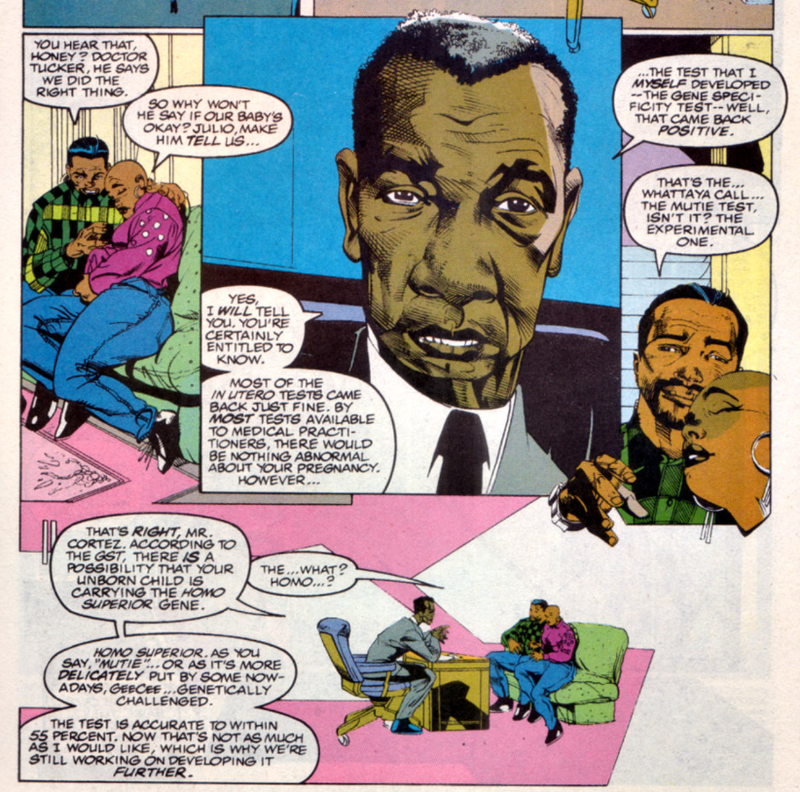 Nor can I really blame anyone for not seeing a resemblance, or at least not registering it as a resemblance versus an example of the visual shorthand endemic to comics — e.g., the eyes on Iron Fist’s mask echoing Spider-Man’s, or every aging man from Jay Garrick to Reed Richards getting white at the temples the same way, or Beast and Wolverine sharing what you’d think would be a singular hairstyle (at least until Liefeld made it a thing with Feral and, especially, complete with muttonchops, Troll, and probably others). FWIW, I've never considered Sinister's quasi-metallic, Colossus-like look to be the result of a costume. I've always considered that to be his skin (with the cape, boots and gloves being a costume). which probably reinforces the "Mr. Sinister kinda looks like Colossus" idea for me. You saying that the metal-like appearance is the costume is the first time that idea ever even occurred to me. 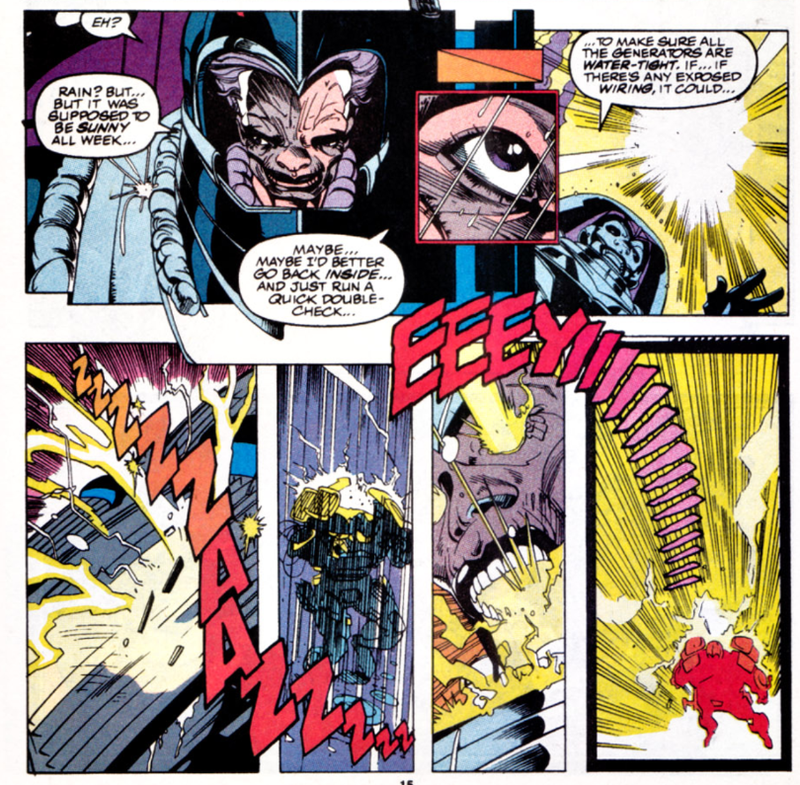 I think the idea of "his body is metal (well, like, liquid metal)" was probably reinforced by his appearances in "X-Cutioner's Song" and X-MEN #23, both of which feature him getting blasted and his body reacting not unlike the liquid metal T-1000 iN T2 (ie, he has a big ol' whole in his chest which then reforms into his usual form), and both which were some of my earliest encounters with the villain. Sorry. The migraine that was descending just as I entered these comments has lifted and I now see that I submitted ^ that one on the wrong post.